The classic bingo game with the retirement theme. The different squares on the bingo card are themed for retirement with sayings like Play Golf, or Shop Til You Drop. The game makes for a good gag-gift, but it also can be played at a retirement party! Everything you need to play Bingo at home. Rotate the metal cage of this classic Bingo game and a random ball will be selected to be called out. 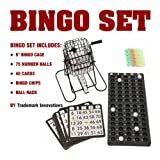 Bingo cards and markers are included, along with simple instructions.